Madikeri: Chief Minister H.D. Kumaraswamy offered prayers to Goddess Cauvery at her birthplace in Talacauvery, Kodagu district this morning. It was his first visit to the holy place after becoming the CM. The last he performed puja at this place was 19 years ago in 1999. Accompanied by his wife Anitha Kumaraswamy, who wore a pink saree, the CM, wearing a white shirt and green silk-bordered dhoti, performed puja at Sri Bhagandeshwara Temple at Bhagamandala before proceeding to Talacauvery. The State’s VVIP couple was accompanied by Water Resources Minister D.K. Shivakumar, Tourism and Sericulture Minister S.R. Mahesh and Virajpet MLA K.G. Bopaiah. 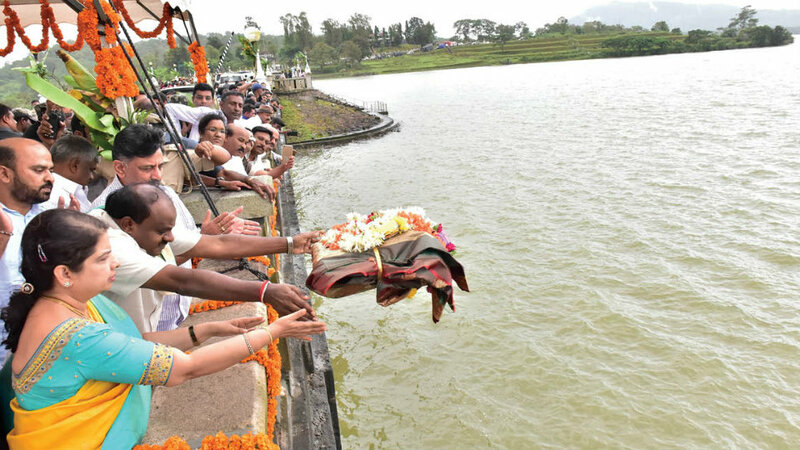 The CM arrived at Talacauvery at 9.15 am, three hours behind schedule and performed puja to the Brahmakundike. He was supposed to arrive at the place at 6 am and if sources are to be believed, the CM waited for an auspicious time to visit Bhagamandala and Talacauvery. Picture shows Kumaraswamy couple performing puja at Talacauvery this morning. At Talacauvery, Kumaraswamy did not forget to mention that he had seen reports in the media that whoever visits Talacauvery will lose power. “I have come here after 19 long years and the media, taking the example of former CM J.H. Patel, had said that even I might lose power. I strongly believe that if God has given me powers, God will safeguard it too,” he said. Kumaraswamy and his wife offered baagina to the Harangi reservoir yesterday afternooon. He also offered prayers to the statue of Cauvery near the crest gate of the reservoir. The CM was accompanied by PWD Minister H.D. Revanna, Water Resources Minister D.K. Shivakumar, Tourism Minister S.R Mahesh, MLAs K.G. Bopaiah, Appachu Ranjan, A.T. Ramaswamy and MLCs Sunil Subramani, Veena Achaiah and S.L. Bhoje Gowda. Kumaraswamy will be offering baagina to River Cauvery at KRS today afternoon. Before coming to KRS, he will visit Kabini Reservoir in H.D. Kote Taluk to offer baagina there. The CM will visit both the reservoirs with his wife, Anitha Kumaraswamy, Cabinet colleagues and senior officials of various Departments. This is the second time that Kumaraswamy will be offering baagina to the Cauvery at KRS. The first time was on July 20 in 2007 when he was the CM of the then BJP-Janata Dal (Secular) government. Fatah, the Class 8 student from Emmemadu village whose video alleging the neglected state of Kodagu went viral, met Kumaraswamy at the DC’s office. The CM had invited Fatah to meet him in Madikeri. The boy requested Kumaraswamy to sanction a junior college to his village, a 3-kilometre road and retaining wall for his village school. The CM assured him to meet the demands soon. Fatah was accompanied by his uncles Abdul Rajak and Abdul Khader. Fatah told reporters that he made the video without the knowledge of his father. The boy said that he was worried about the future of Kodagu. In the video, Fatah said that people in the district suffer, particularly during the rainy season.